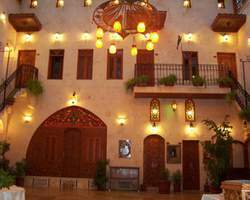 Tourath House Hotel is located n the center and mid of Aleppo city. It is in the middle of the main market. * Completely furnished private bathroom. * Colorful TV with satellite for each room. * 24 hours service per day. It is the main restaurant of the hotel, the place in which the taste men meet. It introduces the Arab, Western and local plates which is adopted by the best cookers of Aleppo.